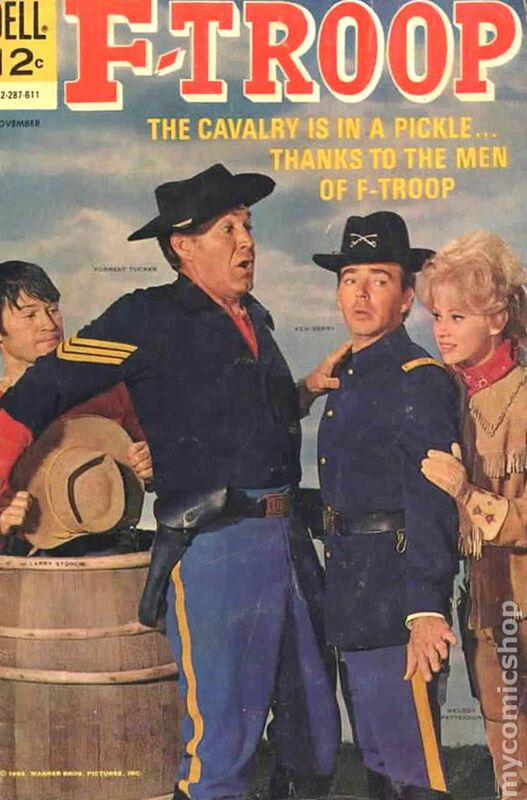 A fumetti of the old TV series F-Troop. According to legend, a railroad conductor mentioned to a Palisades resident that his passengers felt let down that the Wild West wasn’t as wild as they’d been reading in the dime novels back east. Much of it tended to be kind of sleepy; there weren’t any daily Indian raids or gunfights or bank robberies or even train robberies. If you came all the way across the country from New York City or Boston, you might expect a little excitement, right? Really, who travels three thousand miles just to see dust, mesas and a few cactuses? The Palisades resident took it to heart. Before long, rail passengers in Palisades got a taste of the Wild West at its wildest. Trains entering town were frequently subject to Indian attacks, shootouts regularly took place, banks were robbed in broad daylight, bad men were gunned down in the middle of the street. So were lawmen. It was frightening to the passengers, who wouldn’t get off the train in Palisades unless it was absolutely necessary. Locals would stroll up to the trains with sandwiches to sell, and would tell tales of how rough life was in Palisades. Notoriety started to grow. Trains would be routed through Palisades even when it took them well out of their way, since passengers would want to pass through the real Wild West. It barely gave the locals enough downtime between trains to wash the beef blood (courtesy of a local slaughterhouse) out of their clothes. Word eventually reached the United States Army, which was horrified and embarrassed to learn that such an open sore of anarchy was popping off daily right in their own backyard. The Cavalry was sent in. It didn’t take long for the Cavalry to figure out what the score was. The locals were ordered to stop dressing up like cowboys and Indians and to stop playing cowboys and Indians. Palisades’ reign of terror was over. Palisades, Nevada declined in later years, following the decline of passenger rail travel in the United States. By 1938, passenger trains ceased to pass through Palisades (known as Palisade by then,) and in 1962, the local post office was closed. Today, Palisade is just another small town in the desert, and today—just like it really was in the 1870s—it’s so peaceful it doesn’t even need a sheriff. If this story seems familiar to you, you might be remembering the old 1960s sitcom “F Troop”, which is based on this hoax. The only difference is that on the show, the “Indians” were supposed to be actual Native Americans, and were not played by white settlers like they were in Palisades’ pageants. A historical marker in modern Palisade, Nevada. Though accurate, it doesn't tell the entire story.